Click the button below to add the CPR221 - ANCIENT ROMAN CONSTANTINE "SOL" SUN GOD COIN PENDANT IN 14K GOLD to your wish list. This exceptional Roman bronze coin was minted during the rule of Constantine II, one of the sons of Constantine the Great (Rome's first Christian emperor). It is set with the reverse side showing a mint condition detailed image of SOL, the Roman sun god. He is holding up his right hand with the globe in his left. The inscription CLARITAS REIPVB translates to the "brightness of the Republic (or State)". The dark brown underlying patina on the bronze coin is highlighted by the bright golden caramel color of the mineral encrustation. It is set in a beautiful, hand-made 14K yellow gold beaded pendant setting. This coin features superb detail and relief and would make an excellent and memorable gift for any "sun lover" or one who appreciates ancient history as well as one of Roman (Italian) descent. Constantine the Great had three sons who, upon the death of their father, had the entire Roman kingdom divided amongst the three of them. Constantine II, who was the oldest son, ruled most of Western Europe. The second son, Constantius II, was awarded the entire Eastern Empire. The youngest, Constans, ruled Italy and North Africa with Constantine II serving as co-emperor. 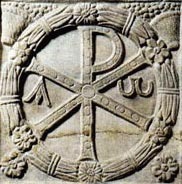 The reforms of their father, Constantine the Great, were maintained under the sons' rule including their dedicated faith and continuation of Christianity as the State religion.